The fourth and final installment of Burn Up Excess delivers more fanservice laden adventure in the story of Team Warrior, the group of police women who covertly take care of assignments the regular police are incapable of handling. While there was not much in the way of overall plot through the earlier discs, the series departs from the episodic nature, with a single storyline spanning the closing three episodes. The clues dropped throughout the show all come together to end the series with a bang. Things open with a new breed of law enforcement officer introduced, the Mecha Cop, whose crime fighting abilities are unmatched. Not only can the robots cite every law in the book, but they are pretty near indestructible, and quickly become popular with the public. Their efficiency poses a threat to the regular police, that is until the machines start misbehaving, and Team Warrior has to deal with the mess. Their investigation turns up a startling discovery, one which Maki remembers all too well from her past. When the top brass puts a halt on her team's activities, she realizes that there is a lot more going on than she ever imagined. The revelations don't end there, and what she finds is a situation beyond anything she could have been prepared for. Team Warrior is in a fight for its life, and a battle to save the city! These last episodes pull together the threads that have been dangled throughout the previous episodes, with a new character whose arrival shouldn't be too much of a surprise if you've been paying attention to the foreshadowing. I'm not usually a fan of waiting until the last few episodes before really taking off on the plot, but the resulting arc works quite well here, and puts a nice finish on the series without seeming like they are cramming in all the story into too short a space. The characters are pretty much as expected, with all their established traits coming into play. Humor is abundant, and as usual, there is bountiful fanservice and plenty of action. 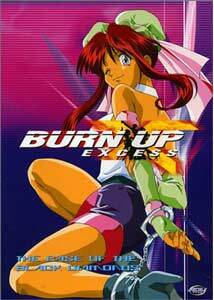 Burn Up Excess won't be a show for those looking for deep plots or complex characters, but it offers a good deal of fun, mature entertainment. Image Transfer Review: Image quality on the final disc gets a bit of a boost due to the slightly better animation used. Colors are strong, if not overly vibrant, there is little in the way of bleeding, and blacks are solid. Aliasing and rainbowing is minor, and compression issues are only an issue in dark blues. Audio Transfer Review: Japanese stereo audio is well presented, with a reasonable amount of directionality across the soundstage. The tonal balance is good, with no obtrusive sibilance or boominess in the low end. Both English and Spanish dubs are also available, and neither had any noteable issues from the sections checked. While not exactly the same as the Japanese, both are perfectly acceptable from a technical standpoint. Extras Review: ADV's trademarked Jiggle Counter� is back, but excessive use seems to have broken it, as there are a number of jiggles that are overlooked. Another collection of production sketches is included, with thirteen more well annotated drawings, including a comparison of the girls' underwear. Clean opening and closing credits are present, as is the show's trailer. The previews section contains The Devil Lady, Zone of the Enders, Colorful, You're Under Arrest Mini Specials, Black Lion, and Aura Battler Dunbine. There was no insert in our review copy. Burn Up Excess offers giggles and jiggles galore in its final outing. It picks up the plot for the last trilogy of episodes, capping an entertaining series full of risqué comedy, wild action, some interesting twists, and copious eye candy.